Give your guitar a full and rich sound by including Tomsline Delay True Bypass Guitar Effect Pedal into your arsenal of guitar effects. With it’s low noise output, you’ll be able to set a variety of delays onto the tone of your guitar to give your instrument more presence in the mix. · Allows wide range of delay time from 50ms to 400ms. · Built-in digital integrated circuit. 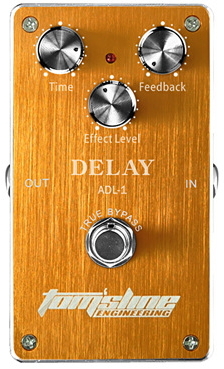 · True bypass design, minimize tone loss and get more control of your pedal. · Aluminum alloy housing, sturdy and durable.